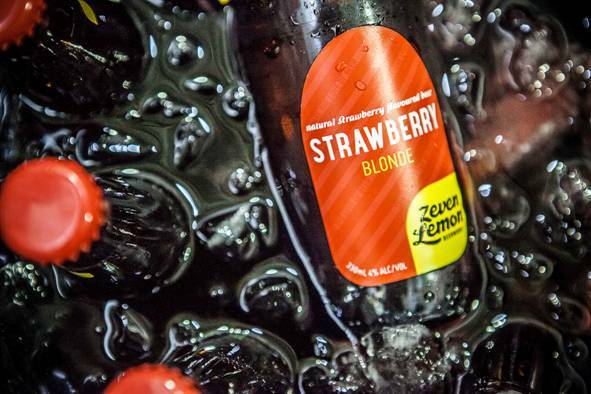 Sydney-based brewer Zeven Lemon Beerworks has launched a strawberry flavoured beer, Zeven Lemon Strawberry Blonde, in Australia. The brewer said the beer was developed to appeal to consumers who enjoyed “the crisp taste of beer and the fruit appeal of cider”. The Zeven Lemon Strawberry Blonde beer combines strawberry juice to its brewed malted barley and wheat beer, which the brewer said created a taste that was “not too bitter but not too sweet”. Zeven Lemon said its beer contains “no artificial preservatives or flavours”. The Zeven Lemon Strawberry Blonde was created by Leimin Duong, an ex-corporate worker who left her job to “follow her passion for beer”. After reading an article about a strawberry beer in Holland, Ms Duong said she saw a gap in the Australian market and taught herself to brew. Two years after Ms Duong began developing the concept of a strawberry flavoured beer, Zeven Lemon Strawberry Blonde is now being launched nationally. Zeven Lemon Strawberry Blonde Beer is available nationally from Dan Murphy’s online, various Victorian liquor stores and online for RRP $14.99 for 4 or $74.99 for 24. Kellogg’s has given its LCM bars a health makeover. PepsiCo Australia & New Zealand has launched a new snack range aimed at school-aged children.